Driven mad by constant ruptures of water mains in his home town of Hamburg, German engineer Lorenz Marak poured his rage into a special project. Convinced that the new-fangled trucks appearing on city streets were crushing the underground pipes with their weight, he would create an unstoppable weapon and present it to the Kaiser. In exchange, he hoped the Kaiser would ban motor vehicles from urban areas. If not, Lorenz could always use the weapon to destroy the trucks himself. Dipl. Ing. Marak had experience with the Imperial Army’s top secret Grosskampfwagen project built just after the end of the Great War, and set out to build something much larger than that 165-ton monster. Starting with scale models, he designed what he called a “Land Destroyer” of about 200 tons, with very wide caterpillar tracks. 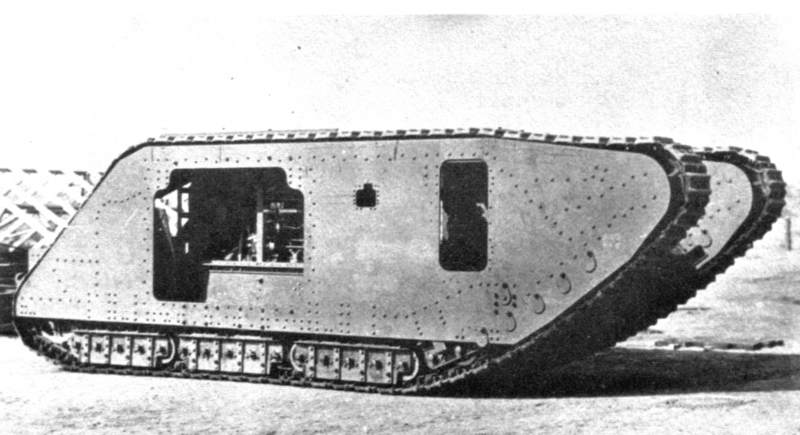 The Grosskampfwagen, like other tanks of the Great War, had a very high center of gravity as it carried all of its weapons within its armored body. Engineer Marak went with a much shorter height, with the driver and assistant driver seated and the engineers having to crouch to service their machinery. The main weapons, 88mm naval guns, would be carried in shielded mounts scrounged from scrapped High Seas Fleet torpedo boats. An armored conning tower between them would aid in spotting targets and in steering the vehicle. One of Marak's early experiments in tread design. Having built a scale model, Marak presented his design to the Imperial Army’s Weapons Bureau in 1922. The officers there were intrigued, but pointed out that currently available engines would have a very hard time powering such a huge vehicle, and the stress would lead to constant breakdowns. The model was carefully stored away, with its designer given a cash award and a new assignment overseeing elevated aqueduct construction in German East Africa, far from the stresses of burst urban water lines. The scale model rested in the bureau chief’s office until 1932, when a new administrator asked what it represented. Told the story, he asked his engineers if they could build a working model with a sufficient power plant. 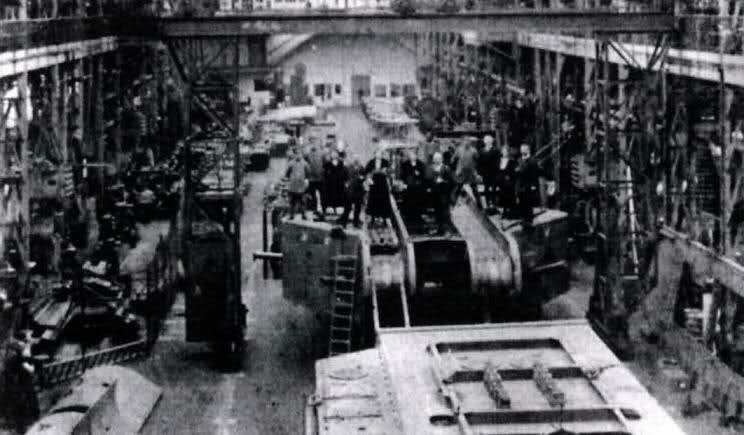 Drawing on secret funds allotted for secret projects, the engineers built a Land Destroyer, equipped it with big new diesel engines and forced it to waddle across the testing grounds at Grafenwöhr. And then they began to make improvements. Just as the Navy preferred turrets on its warships, the designers replaced the shielded 88mm guns with a pair of turrets for 150mm (5.9-inch) naval guns. The hull became larger and taller to allow mechanics full access to the machine’s engines while fully protected by the vehicle’s armored skin. The designers also added several 20mm anti-aircraft guns in armored ball turrets, and special armored bays within the vehicle to transport two full platoons of infantry. This was a much larger and more powerful vehicle than the Land Destroyer, so the engineers upgraded the name to "Land Cruiser." 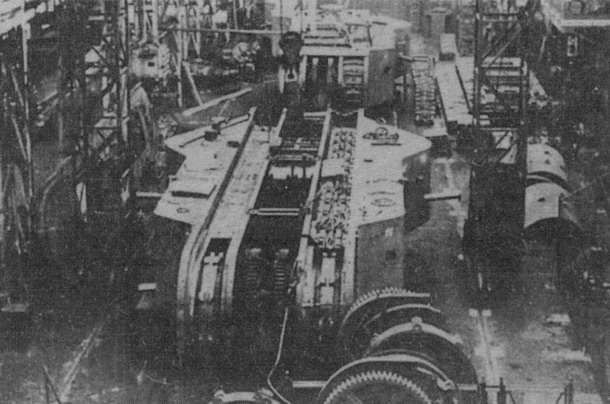 The Imperial Land Cruiser Marak under construction, 1935. To help protect the project’s secrecy, the Weapons Bureau also ordered a series of large, fully-tracked tank recovery vehicles using the same tracks, lower chassis and engines as the Land Cruiser. Equipped with heavy cranes and protected by armor, the big vehicles simply picked up damaged tanks and carried them off the battlefield, even when under fire. That was the theory, anyway, one based on the notion that a new war would be similar to the Great War but fought with better weapons. Special railway cars were also built to move the huge transporters where they were needed. The armored recovery vehicles seemed actually useful, but they excelled in their primary role: to provide a plausible cover for the Land Cruisers’ construction. The Land Cruisers were assembled inside large buildings resembling zeppelin hangars from the outside. Many of their parts were also used in the Imperial Army’s large SturmPanzer 35 tank, an infantry support vehicle. And in an unusual example of inter-service cooperation, the Imperial Navy agreed to place orders for a number of key parts and sub-assemblies and claim that they would be used in submarines. Some of these actually did see dual use. Four big vehicles were built to the first design, completing in 1936, and they seemed relatively successful. They were proof against anti-tank rifles and high explosive shells, and could move slightly faster than marching troops. They had enormous firepower, and were sure to provide a nasty surprise to the Reich’s enemies. Assembling the Imperial Land Cruiser Rouleau, 1939. The Weapons Bureau authorized a second series of four vehicles in 1938. Further refinements replaced the naval guns with a lighter-weight 128mm (4.7-inch) weapon with better indirect fire capability. Mounted in dual turrets, these new weapons also provided a more effective anti-tank weapon, as Imperial intelligence agencies began to report French and Russian experiments with huge formations of tanks. The new Rouleau-class had much more powerful diesel engines modified from a new type developed for use in submarines. Performance remained about the same, as the new monsters carried much thicker protective armor. They retained the troop bays, and wielded a heavier anti-aircraft armament than the preceding quartet. 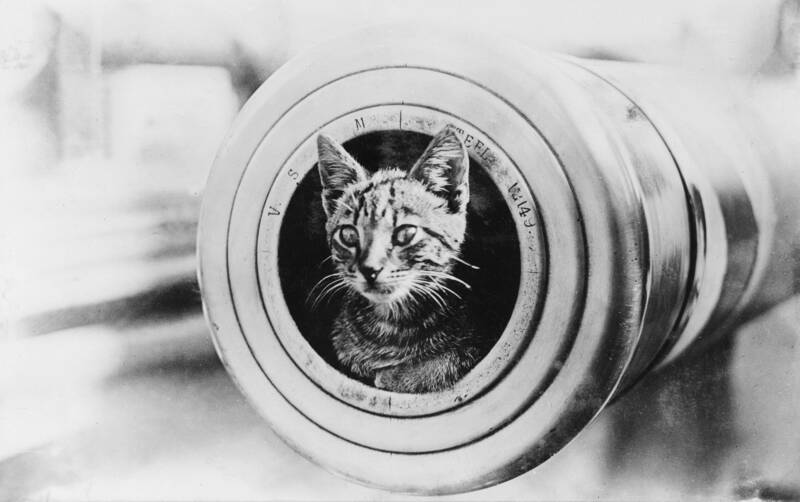 The special katzenkopf ammunition was deemed a failure. All eight machines together formed the 1st Mechanical Support Brigade, a unit described in official records as one dedicated to repair of tanks and other heavy vehicles (thus the assignment of experienced mechanics and tank crew). Officially, it operated a dozen of the armored heavy tank-lifters based on the Land Cruiser chassis. Training at its base near Augsburg consisted of “dry runs” for the crews aboard the Land Cruisers themselves, and tabletop exercises for their commanders. The French and Russians would be kept unaware of the Land Cruisers’ existence, even at the cost of limited training. The Imperial Army’s emergency mobilization decree of 8 September 1940 found all eight Land Cruisers operational and ready for immediate deployment – because of security concerns no reservists were assigned to the 1st Mechanized Support Brigade. The high command decided to move the Land Cruisers quietly by night to a supporting position behind the Groener Line fortifications in Lorraine, but the French shattered those fortifications before the brigade arrived. Instead of moving at the head of a well-organized counter-attack, the Land Cruisers would be sent into action where they stood, to counter the armored spearheads moving quickly toward their bivouacs. With Imperial permission – though until he gave his permission, Kaiser Wilhelm II had no idea that the Land Cruisers existed – all eight machines would be sent into battle as soon as possible. Relaxing on the slopes of Mt. Kilimanjaro, Dipl. Ing. Marak read of the big machines’ shocking debut in combat and frowned. Somewhere in Lorraine, many more pipes had just burst. Click right here to order Land Cruisers right now.